Godzilla Returns to San Leandro! Chances are you’ve probably heard about it on the podcast, but there’s just TOO MUCH AWESOMENESS to NOT keep sharing this event! 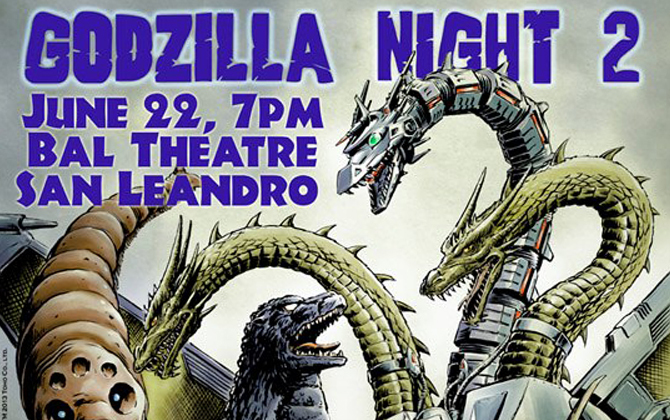 Make sure you make it to the Historic BAL Theater for BAFE’s second annual Godzilla Night on June 22nd! The monstrous double feature for the night will be the Heisei classics GODZILLA VS. KING GHIDORAH (1991) and GODZILLA VS. MOTHRA (1992)! But Godzilla Night is way more than a movie screening… check out the amazing programming that the BAFE crew are putting together! The third installment in what fans have dubbed the Heisei era of Godzilla (1984 – 1995) and a fan-favorite for many reasons, this film features the return of Godzilla’s most deadly foe, King Ghidorah! It was directed by Kazuki Omori (director of the previous entry, Godzilla vs. Biollante) with special effects by Koichi Kawakita. 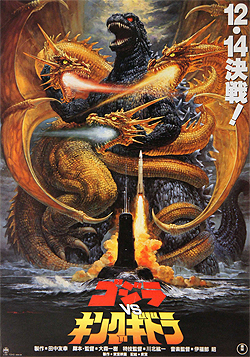 In addition to the three-headed monster from space, this movie sees the return of composer Akira Ifukube and actor Yoshio Tsuchiya and several themes and homages from classic Godzilla plots. As author Kenichiro Terasawa attempts to uncover the true origin of Godzilla, Japan is visited by a UFO. The visitors are not from another world, but from another time… the future. These time traveling futurians have come to 1990s Japan to warn the country that if left unchecked, Godzilla will destroy Japan. Taking the futurians up on their offer to eliminate Godzilla from history, the Japanese government sends its representatives, psychic Miki Seagusa and Professor Mazaki with Terasawa to the past with the Futurians cyborg M11 (played by Robert Scott Field). 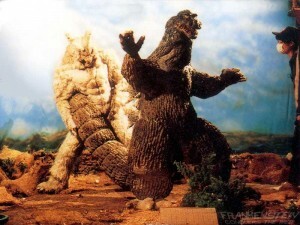 But will the plan to erase Godzilla actually work or are these strange visitors up to no good? Much more than a remake, the next film in the Heisei era blends elements from Mothra’s showa encounters and adds a new baddie to the roster of Godzilla’s enemies, Battra. This movie is Takao Okawara’s first kaiju epic and he would go on to direct several more science fiction spectacles for Toho, namely Godzilla vs. Mechagodzilla (1993), Yamato Takeru (1994), Godzilla vs. Destoroyah (1995) and Godzilla 2000 (1999). A giant typhoon unearths Mothra’s egg on a small island in the Pacific and a team is sent to investiate. As they explore the island, they encounter two miniature women who call themselves the Cosmos. These tiny beauties tell the protagonists of Mothra and her darker half, Battra who is already assaulting Japan. The egg is loaded on a transport to Tokyo, but during the voyage Godzilla appears and attacks the egg, and it hatches. 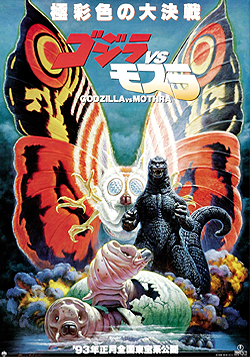 The Mothra larva is under attack, but Battra appears, challenging the King of the Monsters and incidentally allowing both the ship and the newborn kaiju to escape. Once back in Tokyo, the twins are kidnapped. But can they be rescued before Mothra destroys the city in its search for the Cosmos? Perhaps better known to Godzilla-fans as Android M-11 from Godzilla vs. King Ghidorah, Robert Scott Field still resides in Japan and will be sharing memories from his time on set with Godzilla, his current career in Japan and take questions from the audience. Also via Skype, co-creator on the newest Godzilla Series, comic artist and kaiju enthusiast Matt Frank will be joining the fracas to talk about the new comic series, GODZILLA RULERS OF EARTH! To celebrate this new series, BAFE brings writer Chris Mowry live in theater and Matt Frank, live via Skype from Texas, to the Bal to talk about their plans for Godzilla in print. Copies of the new comic will be available at the show, as well as collectible flyers from IDW. Listeners to the Kaijucast will recognize the music from KODOJA, the kaiju-inspired soundtrack that accompanies the comic book of the same name. Both were created by Keith Foster of the funk sensation, Big Pimp Jones. Word on the street is that the band will be performing not only tracks from their Kodoja and Project Kyojo releases, but some additional kaiju goodies! Recently added to the night’s programming is Mark Jaramillo, a Godzilla fan who has tracked down and uncovered the truth behind the myth of what kaiju fans speculated could have been an unfinished Godzilla film. LEGENDARY GIANT BEAST WOLFMAN VS GODZILLA is essentially a fan film, but it was spearheaded by professional filmmaker Shizuo Nakajima and several former filmmakers of Toho Studios in 1983. 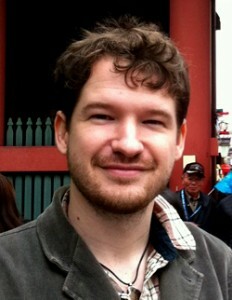 Shizuo Nakajima had learned many film techniques and finer points in filming such as photography and special effects. Also known for being both a major fan of Godzilla as well as being favored in Toho’s Art Department, Nakajima and a few friends of his had decided that due to their acquired talents on part from their work at Toho that a film of their own should be made to show off their talent. Mark will give a presentation on this rarely seen independent film and the footage to be screened at the Bal will be DIFFERENT than what will be shown at G-Fest in July! Godzilla Night 2 will be the first time this footage will be publicly shown! Also, movie posters will be available! The lobby of the theater will have vendors set up to quell your need for Godzilla toys, merchandise and collectibles! Notable vendors will include Kevin D’s Kaiju, Kimono My House, Plus both Big Pimp Jones and the Kaijucast will be sharing a table! Make sure you swing by because I will have a limited edition Kaijucast print available! Raffle tickets cost $5.00 each (Limit 10 tickets per person) and will be on sale online until June 20th, 2013. After June 20th. raffle tickets will only be available at the event. There are limited quantities of Online Raffle Tickets, so don’t delay in your ticket purchases! The Online Raffle is open to Anyone of Legal Age (18 & Over) and is also open to all countries that allow participation in Raffles, Lotteries, & other contests of this nature. Check out the image at the bottom of this post for pictures of the prizes! And if you pre-buy tickets to this show, either at the Bal or online at Ticketweb, you will get a free 11×17″ Godzilla Night art poster by Japanese artist Shinji Nishikawa! This is an art only poster and does not have the titles or text used on the promotional posters for this show. If you haven’t made plans, do so immediately and make sure you swing by and say hello at some point during the night!